It’s a fast and easy, veggie-loaded kind of week. Did you catch Monday’s Peach Pineapple Green Smoothie? Today, we’re doing lunch – this 5 Minute Veggie Sandwich with Hummus and Feta is healthy, tasty, and ready in a flash. In the summer, I’m guilty of overbuying produce (like, waay overbuying). How can I not with all those ripe mangoes, gorgeous berries, and homegrown tomatoes at such great prices?? So last week, I needed to clear a few extra veggies out of the fridge before making my next weekly trip to the grocery store. A roasted vegetable sandwich sounded great, but I didn’t have the time. So I opted for the raw version instead. I popped a few slices of sourdough into the toaster and started slicing the vegetables. 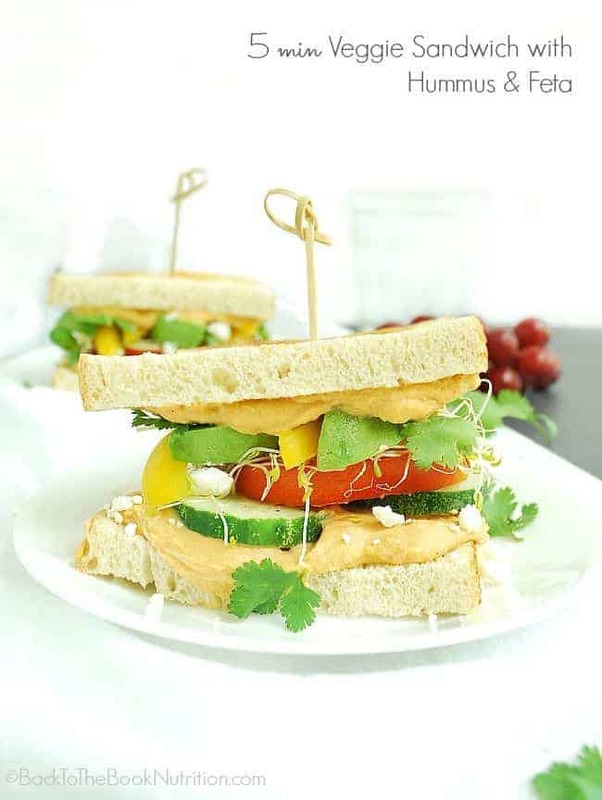 When the toast was ready, I gave it a generous smear of red pepper hummus and started piling on the veggies – cucumbers, tomatoes, sprouts, yellow pepper, and avocado, with sprinkles of sea salt as I went. Then some crumbled feta – because, really, what isn’t better with feta? – and a few sprigs of fresh cilantro. Voila – a healthy lunch in five minutes! 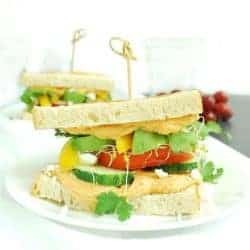 The beauty of this sandwich is that you can use whatever vegetables you have on hand. The hummus, feta, and cilantro can be swapped out for other spreads, cheeses, and herbs too – just choose replacements that give an equal punch of flavor. Toast the sourdough, then spread a generous amount of hummus on each slice. Stack the vegetables, sprinkling with sea salt as you go. Add the feta and cilantro and serve. Check out these other Veggie Loaded Recipes!